Working as a staff attorney can have both benefits and detriments. Worst of all for a perspective staff attorney is how he or she is could be treated as a second-class citizen by other attorneys. Keep reading to see if working as a staff attorney is the correct move for you to make. Summary: With many major law firms hiring staff attorneys more frequently, this article explores what working as a staff attorney is like and if it is worth it. I expect this trend of hiring staff attorneys will continue. Law firms are increasingly hiring more and more staff attorneys and fewer and fewer full-fledged associates, partners, and counsels. The rule I have learned is this: (1) anyone called a staff attorney or anything other than an associate (such as a “special associate,” which is one term I heard recently) is not an associate; (2) counsels are more and more likely to actually be staff attorneys; and (3) a good percentage of younger and older partners are on such thin ice that they might as well be staff attorneys—but not all are. These staff attorney positions have been multiplying like mad, and I see no sign it will decrease anytime soon. This article is organized into four parts. First, it examines why there are more staff attorneys and why this trend is gaining momentum and unlikely to slow down. Second, it discusses a few of the disadvantages of law firms hiring staff attorneys. Third, it sets out advantages of working as a staff attorney. Fourth, it sets out disadvantages of working as a staff attorney. Interested in Working as a Staff Attorney? Go Here to Find Staff Attorney Jobs on LawCrossing! This song and dance goes on over and over countless times each day. Law firms love making this pitch and clients love hearing it. Despite having astronomically high billing rates for partners and associates, law firms can make it look like they are doing everything within their power to save money for clients by using staff attorneys for much of their work. This allows law firms to look like they are the “good guys” and save the client money. Law firms do not just use this tactic with new clients. They also use it with existing institutional clients. Existing institutional clients are often told that the law firm has come up with “new ways” to save them money and will start using these new ways going forward. Law firms will start staffing large cases and routine matters with staff attorneys and send clients bills that look better because they include so many “low-cost hours.” This makes the law firms look like they are evolving to keep costs down. Have you seen your law firm face pressure to keep the billing rates down? What did they do to make this happen? There are certain practice areas in which law firms are facing massive downward billing pressure and with respect to which the law firms can never be sure of a continual flow of work to keep attorneys busy. Law firms are increasingly (and rightly so) using more and more contract attorneys in these practice areas. Trademark - Trademark is a practice area in which there are potentially more staff attorney jobs than there are associate, counsel, and partner-level jobs inside of large law firms. The work typically does not cost a lot of money to perform, and much of it is “one off” in nature (done once). This tends to be the sort of work that is only performed when the economy is doing very well. When the economy slows down, even large law firms often do not have enough work to keep a trademark attorney busy. There is a lot of pressure to keep billing rates down for this type of work because smaller law firms that are specialists in this sort of work are willing to do it so cheaply. There are also relatively few of these jobs; when law firms have them, they typically receive an overabundance of highly qualified candidates for them. Law firms do not need to pay “full freight” for people doing trademark work, and because there are so few opportunities, attorneys are willing to accept positions as staff attorneys. Employment - Employment is a field that is increasingly becoming a commodity. Except for employment class actions and some other high-profile employment litigation matters, law firms are under a lot of pressure to keep their bills low. This means low rates for simple employment litigation and day-to-day employment counseling. There are tons of employment specialist law firms and smaller law firms willing to do the work at a low cost. These firms are in competition with large firms for routine work, and the only way that major law firms can hold onto this sort of work is to have highly-qualified staff attorneys do it. Because the costs are being driven so low for employment-related work, many large law firms are getting out of this work completely. Litigation - Litigation is a practice area in which law firms are using staff attorneys more frequently instead of regular associates. Litigation has become so overrun with attorneys that law firms are finding they do not need to staff many of their cases with real associates because there are so many highly-qualified, smart, and motivated staff attorneys for each job that they have. Litigation is the most popular practice area by far, and there is a lot of pressure to keep bills down, do briefs, document reviews, and research projects at the lowest possible cost. Staff attorneys will often prefer to work as staff attorneys to work more predictable hours. Many large law firms are now hiring large pools of staff attorneys for their litigation cases because they have learned that one or more matters can often settle or go away, creating the potential for mass layoffs of associates in many offices. Law firms can avoid the morale issues and bad headlines that come with mass layoffs by hiring less permanent staff attorneys to do much of the work. Patent Prosecution - This practice area is increasingly becoming a practice area inhabited by broad swaths of staff attorneys inside of law firms. There has been constant downward pressure on the billing rates of patent attorneys in large law firms, and much of this work has become “fixed fee” in nature. Hiring staff attorneys is one way for law firms to contain costs. There is not an overabundance of most types of patent attorneys, and typically there are far more patent attorney applicants (especially in markets like New York and the Bay Area) than there are jobs for patent attorneys. Patent attorneys are more likely than other types of attorneys to switch jobs and engage in job hopping. Patent attorneys, therefore, are more at risk of leaving. Immigration - This is also a practice area in which law firms are increasingly hiring more and more staff attorneys. There is huge pressure for low billing rates for immigration work. Immigration-only law firms pay some of the lowest salaries there are in the legal field—so much so that many immigration attorney salaries are (to my astonishment) lower than what the average college graduate makes! Notwithstanding, law firms get requests for this sort of work and need to do it cheaply to be competitive. Many of a firm’s large corporate clients may bring people in from foreign countries consistently and need the related immigration work done inexpensively. Most immigration-related work is relatively routine and does not require expensive attorneys. Law firms typically do not have much difficulty finding and hiring immigration attorneys and often see no reason to hire associates, counsels, or partners for these roles. Corporate - When a litigation and insurance-centric law firm is attempting to break into corporate, the firm often will hire staff attorneys to start because the firm does not know how long the work will last. Data Privacy and Technology Transactions - Many law firms are getting more and more requests to do this sort of work and hiring staff attorneys to do it. Does your law firm have more staff attorneys in certain practice areas? Which ones? See Why Every Big Firm Practice Area Eventually “Self-Destructs” at Least Once Every Eight Years for more information. Law firms are under incredible pressure to maintain and grow profits per partner. The attorneys who generate the most revenue–and the partners who have the most business—will most often go to the firms with the highest profits per partner. While different law firms may have different levels of prestige, the real metric of prestige in many attorneys’ minds is profits per partner. Firms can bill more hours because clients are paying lower billing rates. Clients tend to look more closely at (and dispute) billing rates that are very high as opposed to billing rates that are very low. Law firms save money because the work can be done more cheaply by staff attorneys. Associates cost a lot of money–as do full salary counsels and partners. It is also a large money commitment to hire these people and keep them around when business slows down. The billing rates of staff attorneys may not be significantly lower than that of associates, but the salaries are. Law firms may pay staff attorneys 50% less or more but will bill them out at only 25% less money–pocketing the difference. This “billing rate-salary arbitrage” allows law firms to earn a great deal of money they might not otherwise earn. Law firms can quickly hire and fire staff attorneys. The ability to rapidly “scale up” and then “scale down” means that law firms can increase their profits rapidly during high-stakes litigation, or when clients are demanding certain types of work. Law firms do not need to commit to hiring associates, partners, and others and to keeping them on payroll indefinitely. They can scale up and then scale down as quickly as they like. Law firms can maintain other practice areas where clients are “rate sensitive” (immigration, employment, and patent prosecution) and profit from these practice areas instead of eliminating them. Instead of exiting practice areas they may not believe are very profitable, law firms can maintain (or even enter) practice areas that would not be profitable if they staffed them with highly-paid associates, counsels, and partners. Properly used and implemented, staff attorneys can dramatically help increase the profits per partner of law firms. What has your law firm done to increase its profits per partner? I am amazed at the number of attorneys out there. Most positions that law firms are hiring for get an oversupply of attorneys applying to them. Law schools continually are pumping out attorneys, and the supply seems inexhaustible. Even attorneys from the best law schools often have a lot of difficulties finding positions. Markets like Washington, DC are like the “attorney apocalypse” filled to the brim with attorneys looking for work: There are so many attorneys in this market that law firms often get hundreds of applicants for each position. Law firms are not stupid. They realize that because there are so many attorneys interested in each position, they do not necessarily need to offer them even the prospect of upward advancement and can hire them as staff attorneys instead. This takes the pressure off the law firms and still allows them to attract good talent for each position that they have. What do you recommend attorneys do when facing an oversaturated market when looking for work? They hire the best new associates they can attract. The new associates work as hard as they can for up to twelve years with the prospect of making partner. The herd of associates gets thinned as associates are fired, leave, or asked to leave. Once an attorney is fired or leaves a large firm for a smaller firm or another practice setting (government, in-house, academia), the attorney almost never will be welcomed back to any major law firm because he or she has gone off the competitive track. New associates are constantly coming in at the junior and middle levels to increase the competition. Senior associates and partners are expected to generate business as a condition of advancement. Counsels and partners are expected to generate more and more business, and those without business will eventually be asked to leave when work slows down, and law firms will simply recruit new partners who have business. This is how it has always worked and likely always will work. Nevertheless, law firms can make money from certain types of attorneys when there are no expectations that the person will be advanced. These attorneys include people such as attorneys who have gone in-house, taken an extended leave of absence, may not have the best law school credentials, or have taken an extended break from the practice of law. Without upsetting the “upward momentum” and competitive pressure among associates, partners, and others inside the law firm, the firm can hire staff attorneys and still have good talent to draw on for its various matters. Hiring staff attorneys allows the law firm to integrate people into its ecosystem it might not otherwise integrate and provide good service to its clients in the process. What kinds of attorneys have you seen hired as staff attorneys? Why do you think they were hired? Should I Accept a Contract Attorney Position? Taking Time Off from Practicing Law: How Will It Impact Your Future Marketability? Many highly-qualified young attorneys now demand flexibility, lower hours, and a better lifestyle because they have concluded that lifestyle is more important to them than money or prestige. Twenty years ago, the thought that a highly-credentialed attorney with world-class qualifications would want to get off the partnership track at a major law firm to become a staff attorney would have been considered insane. These days, it is increasingly common and something I hear consistently. Law firms seeking to have very intelligent and talented people working on their matters can often hire extremely qualified staff attorneys more cheaply than they could hire more traditional attorneys. This allows law firms to have people with the smarts and intellectual firepower to do work while offering them the benefit of lifestyle considerations. How much do you value flexibility, lower hours, and a better lifestyle in your legal career? While I toyed with the idea of even including this section, it is important to understand that many law firms do not make a huge distinction between staff attorneys and associates on their websites and to their clients. I have even seen some law firms call all of their staff attorneys “associates” on their website but not call them associates internally. I am not sure of the ethics of this, but law firms certainly have been doing this sort of thing with partners for decades—the income partner versus the equity partner, for example. With staff attorneys, law firms can pay them differently and give them no expectation of advancement but then charge them out at the same rates as associates to their clients. Law firms may justify this based on the fact that their staff attorneys are just as qualified to do the work and it is their business how they pay, title and advance their employees—which is true. Does your law firm list staff attorneys on its website? Do you think a firm should or should not list this? See What Law Firm Titles Mean: Of Counsel, Non-Equity Partner, Equity Partner Explained for more information. In the case of many attorneys, the law firm does not need to hire them as anything other than staff attorneys because their backgrounds suggest they will never advance anyway. Many law firms argue it is more honest to hire them as staff attorneys than as titled attorneys because this does not give them the mistaken impression that they will be advanced when they will not be advanced. One could argue that it is far more honest to hire someone who will never advance anyway in the role of a staff attorney as opposed to in another role. How often does your law firm advance its associates? What Causes Associates to Leave Law Firms? The largest and oldest law firms have often “tapped out” their partnership ranks and have very little interest in making new partners. They would prefer to have as many “workers” as possible and as few people trying to advance as possible. Having fewer people to advance to partner (or to share profits with at the partner level) makes the attorneys feel safer. It is no surprise that a lot of hiring of staff attorneys tends to happen at the law firms that are the oldest and most hierarchical. How much room does your law firm have at the top? Does this concern you? It means there is less competition for advancement and to be a partner. Most associates are threatened when people are hired because new hires represent competition. Hiring staff attorneys means there is less competition because the staff attorneys are told at the outset they will never advance. It allows the law firm to allocate more “busy work” to staff attorneys and more important work to associates. Law firms can delegate “busy work”—such as document review, discovery, proofreading, and other mundane tasks—to staff attorneys and leave more desirable projects for regular associates. All of these things help with associate morale. How is the morale of associates at your law firm? Why is it in this state? See Top Ways for Law Firms to Increase Associate Satisfaction and Increase Associate Retention: What Law Firm Associates Really Want from Their Jobs for more information. Law firms that hire staff attorneys often do not have to worry about training and coddling them as much as they do associates and others. The staff attorney may be given various projects to do that are not as complex and do not require as much training. The staff attorney may already have a lot of experience in his or her practice area and not need a lot of training. What do your law firm training programs look like? Do you feel they are good enough? Why or why not? 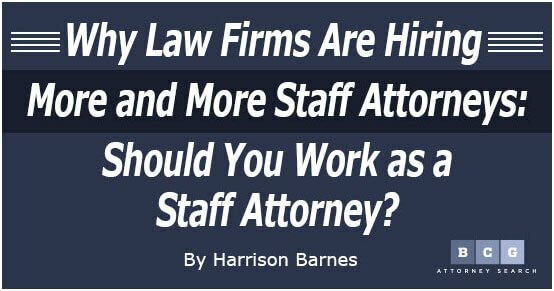 Staff attorneys typically have far fewer employment options than full attorneys, which means law firms have more control over staff attorneys. A talented young associate upset with the quality of his or her work, or his or her treatment by others in the firm, can often go to another law firm. In contrast, the staff attorney does not have the same options. Law firms therefore often have more control over staff attorneys than they do better-titled attorneys inside of their law firms. Have you seen your firm exercise more control over its staff attorneys? How? See Do Not Allow Others to Be in Control of Your Career and Life for more information. When law firms lay off people, the staff attorneys are most often the first to go. Law firms almost never advance staff attorneys to associates or partners. How important is it to know that your law firm is committed to the advancement of its staff? While there are many advantages to law firms hiring staff attorneys, there are also disadvantages. Law firms should be careful when hiring staff attorneys because there can be many negative ramifications. When a law firm hires a staff attorney, the attorney is most often offered a staff attorney job because the same attorney would not be able to otherwise qualify for and get a real associate, partner, or counsel role in the law firm. In the majority of instances, getting the job as a staff attorney is a “gift” of sorts. There are, of course, attorneys who want to be nothing more than a staff attorney—in fact, this is increasingly common—but this is the minority. Many young attorneys who are hired as staff attorneys quickly decide that they are just as valuable—if not more valuable—than the better-titled attorneys working in the law firm with them. They know what associates and others are making and resent it. The associates inside of the law firm often do not allow these attorneys to feel included in what is going on inside of the law firm and this hurts the staff attorneys. The staff attorney becomes increasingly aware of his or her second-class status and starts to resent it. The staff attorney may have gone to a great law school and formerly worked at a great law firm and wonders how they got where they are. If the staff attorney is older, he or she may resent taking orders from junior associates when the staff attorney had the same job ten or more years ago. Staff attorneys sometimes become angry and speak with their bosses and ask to be advanced, paid more, and so forth. This is uncomfortable for the partners and others because these conversations become more and more frequent. Partners may tell staff attorneys they will “see what they can do” or otherwise postpone uncomfortable conversations, but this is about all that ever happens. The staff attorney becomes increasingly angry and starts applying and looking for new jobs. When I speak with staff attorneys, they are often very negative about their law firms and not happy about the situations that they are in. They desperately want higher paying jobs, more prestige, and to feel like equals. They start exploring other career prospects and do so in a frantic sort of way. They may not care what the other job is—they just want out. When the staff attorney experiences problems finding another job, he or she become disheartened and his or her work quality often suffers. The staff attorney also often develops a bad attitude toward not only his or her work but the law firm as well—and then the law firm has to fire the staff attorney. I see this pattern a great deal in my practice. This is not the case for every staff attorney, of course, but it often is. Law firms need to be very careful about the sort of staff attorneys they hire and make sure the people they hire want the role. The best staff attorneys are those who are unconcerned with prestige and advancement, who do not care what others think, and who just want a job. It is generally not a good idea to hire someone who is just taking the position as a last resort, as they will want to leave. Have you ever seen staff attorneys that were treated as second-class members of your law firm? How did it affect them? The staff attorney can often lower morale among the regular attorneys and staff. Because many staff attorneys feel like second-class citizens and have gripes against their law firms, they infect those around them (staff, associates, other staff attorneys) with their lower morale. Their lower morale brings everyone down and affects the quality of work the law firm is doing and the commitment of the attorneys. Young associates and others may see people working as staff attorneys who went to great law schools and once worked at great firms as associates and wonder if this is what is in their future as well. Having a bunch of staff attorneys in your firm may not just affect morale, it may also take the steam out of the engine of the firm by having people who are not motivated work side-by-side with associates who are supposed to be motivated. Law firms that have all of their work done by associates may end up maintaining a more competitive environment, with higher morale, and have better quality work done across the board as well. Does your law firm have staff attorneys? How does this affect the morale of all of the attorneys at your firm? See 8 Reasons You Are Not Motivated and Why You Need to Stay Motivated No Matter What! for more information. Many staff attorney jobs are 9:00 to 5:00 jobs, where you are expected to show up at a certain time and leave at a certain time. Unlike an associate job (where there is never a break and the attorney may be working seven days a week), the staff attorney job can offer the opportunity to work predictable hours and collect a paycheck while still practicing law. In fact, in the best of circumstances, the staff attorney may earn more money per hour working as a staff attorney than as an attorney with a better title inside of a law firm. There is no certain type of person who enjoys this more than others. Mothers are the ones that take these jobs and want them the most often, but it is also often men pursuing these positions who want more time with their families or to pursue various outside interests. Would working better hours be worth a demotion in title to you? See Why Alternative Work Arrangements Make Sense for Law Firms for more information. Staff attorneys are just there to do the work. They are not under pressure to bill a ton of hours, bring in business, or anything of the sort. They do not need to worry about politics, impressing certain people, or anything of the sort. The staff attorney is not under anywhere near the pressure that better-titled attorneys are under and they often love and appreciate this role. In fact, the staff attorney job is about as close to an “in-house counsel” role that an attorney can have without actually working inside of a company. Is having a lower pressure job worth a pay cut to you? While it is changing, staff attorney jobs allow attorneys to work in law firms who might not otherwise have the qualifications to work there. There is often far less competition for these jobs, and therefore you can get them more quickly than other kinds of positions. If you went to a poor law school, did not do well in law school, have taken a lot of time off, are too senior, do not have experience in a major law firm, did not summer with a major law firm, are coming from in-house, are working for the government, working in a small law firm, or were fired from a major law firm, you still could get a staff attorney position in a major law firm. Working in a major law firm as a staff attorney is something that will allow you to see how the inner workings of a major law firm operate. You may be exposed to and be able to do more sophisticated work than you would be able to do in a smaller law firm. Because the salaries and advancement potential are lower, it is also easier to get a position as a staff attorney. You will not be competing with as many people to get these jobs and will have an easier time getting them. You may not even have to interview with very many people to get the position. Many staff attorneys start work in major law firms within a few days of their first interview. Interested in Becoming a Staff Attorney? Find Staff Attorney Jobs on LawCrossing Today! Have you ever considered working as a staff attorney? Would you ever consider it? Why or why not? See To Temp or Not to Temp for more information. While rare, it is not unheard of for staff attorneys to transition into full-time associate roles inside of law firms. If you have the dedication and smarts and connect with the right people, law firms will sometimes advance you. While I have seen the occasional attorney advanced, I should note that it does not happen very often. In most instances, to be advanced, you will need to have the sort of law school and other qualifications that meet the law firm’s traditional “cut off” for hiring attorneys. There are exceptions to this, of course, but generally, to be advanced you must meet the firm’s threshold hiring criteria for regular associates. Have you ever seen a staff attorney become an associate, counsel, or partner in your firm? What happened? Staff attorneys are often given work that is equally challenging to the work partners and associates do. 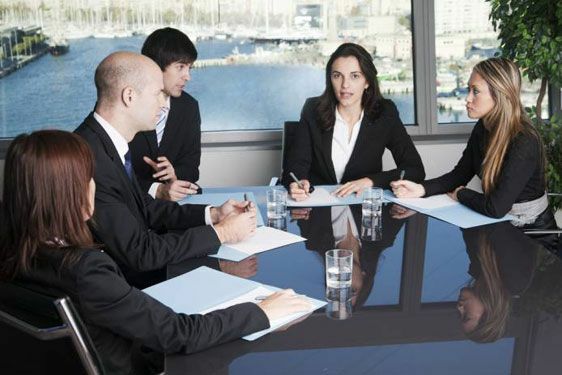 Many attorneys enjoy the work that they do as staff attorneys and are very happy working as staff attorneys because of the challenging nature of the work that they are given to do. What kind of assignments are staff attorneys given in your law firm? See Challenge Yourself and Get Input from Others for more information. As discussed above, most staff attorneys are never advanced beyond the title of staff attorney—it happens but is extremely rare. In addition to not getting a better title, staff attorneys also cannot count on raises or other forms of income advancement. Once someone becomes a staff attorney, that person has most often “frozen” his or her future income in one place and will rarely receive much other than inflation-adjusted raises. If the staff attorney does receive a raise, it will likely not be equivalent in scope to what associates and others are receiving. While many staff attorneys have no interest in being “on the treadmill” and advancing, their lack of advancement opportunity is often something that they come to resent later on. They watch other attorneys in the firm advance and move up the income scale, and they never do. Why are law firms so reluctant to advance staff attorneys? The staff attorney does not have the same level of respect on the prestige ladder as other attorneys in the firm, and this is something that simply goes along with the staff attorney title. Because of their second-class status, their opinions and work may not be given as much weight and they may not be given the best assignments. When staff attorneys do good work, they may have to tolerate others taking credit for it. Inside of law firms, everyone knows who the staff attorneys are—the secretaries do, the receptionists do, the paralegals do, the associates do, the contract attorneys do, and the partners do. Staff attorneys will typically be given smaller offices (often interior offices) and less support (secretaries and paralegals) to help them with their projects. Lawyers and others will have less tolerance and patience for personality quirks of the staff attorneys (such as getting angry at others in the office) than they might have for the brilliant associate, for example. Staff attorneys may not be invited to all of the firm functions that associates and others go to. Staff attorneys may not be allowed contact with clients of the firm. Staff attorneys’ names may not be placed on pleadings filed with the court. Staff attorneys may not be invited to closings, go to court, or do other desirable jobs within the firm. Staff attorneys will often be given work that no one else wants to do. Indeed, while some law firms may treat their staff attorneys better than others, the job is something that constantly reminds the staff attorney of his or her second-class status. This is something some staff attorneys may happily and willingly tolerate, and something that others may not be happy with. The examples above do not apply to all law firms, but they apply to many. Have you seen any of these examples in your law firm? What can you do to combat this behavior? See Do Not Be Controlled By Your Need to Feel Significant for more information. Most staff attorneys are paid far less than even junior associates inside of the law firm–and yet they may be doing more sophisticated work. Even a staff attorney with 20 years of experience may be paid less than a junior associate inside of a major law firm. Staff attorneys may resent the income disparity. In most cases, the staff attorneys inside of major law firms are paid less than half of what first-year associates are paid. Do you think it is fair that staff attorneys are paid so low compared to regular associates? Did you take a job as a staff attorney because you did not want to commit to working hard? Did you take a job as a staff attorney because it was the best job you could get? Did you take a job as a staff attorney because you do not care about money or advancement? All of these questions brand the staff attorney in a negative way when he or she is looking for a new position. While none of this would be of concern if there were not a lot of competition for attorney jobs, there is a ton of competition. Therefore, law firms will not bother with people about whom they have to ask these questions, as the firms can simply hire people without that potential baggage. Have you seen a former staff attorney get a job at another firm as an associate? How did they do it? Many staff attorneys are a bit angry about their roles as staff attorneys and have some resentment about their jobs. They are mad that they are paid less, not treated as well, made to feel like second-class citizens, and in some cases given grunt work. Because of this resentment, they are often unhappier than they would be if they were working in a major firm as an attorney with a better title. This is important to consider before taking a staff attorney role because if you feel resentment at your role, then you may never be happy where you are. Many staff attorneys are constantly looking for new positions, feeling excluded, and reminded of their second-class status on a daily basis. Unhappy and not feeling valued, many staff attorneys are unhappy in their jobs. I speak with staff attorneys all the time. 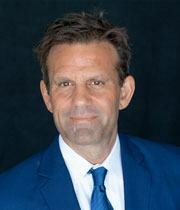 They are almost uniformly more desperate to get new positions than any other class of attorney–associate or partner. They want to get out of their firms, and in my opinion, the resentment they feel is greater than the pressure the overworked and stressed associates experience that drives them to look for new positions. Do you know any staff attorneys? Do they resent being in their current position? See The Only Way to Be Happy Practicing Law for more information. Unlike associates who are often the product of huge investments in recruiting, training, and grooming, law firms make no such investments with staff attorneys. Law firms frequently spend great sums of money sending their attorneys on retreats, conferences, and assisting them with business development, but often do not include their staff attorneys in any of this. Most law firms invest less in their staff attorneys than in regular attorneys. With less investment (and because they are often thought of as second-class attorneys), law firms are also most likely to let staff attorneys go first when things slow down—not regular associates. Letting go of an associate is more likely to upset the morale of others in the firm than letting go of a staff attorney. Staff attorneys, therefore, are more prone to getting laid off by law firms. Do you think firms should invest more in staff attorneys? Why or why not? See Being the First to Say Goodbye for more information. The role of the staff attorney inside of a law firm involves a series of choices that both law firms and staff attorneys need to balance. There is no doubt that the role of staff attorneys is a positive development for many attorneys and law firms, and the trend of major law firms hiring staff attorneys is likely to continue in the future. Nevertheless, this role is not without its share of substantial difficulties, and this can lead to a lot of problems on both sides. Do you think working as a staff attorney is a good idea? Why or why not? Do you think it is smart for law firms to hire more staff attorneys? Why or why not? Are you currently a staff attorney? What advice would you give to other attorneys considering this choice? Share your answers to above questions and any other thoughts you have about this topic in the comments below.